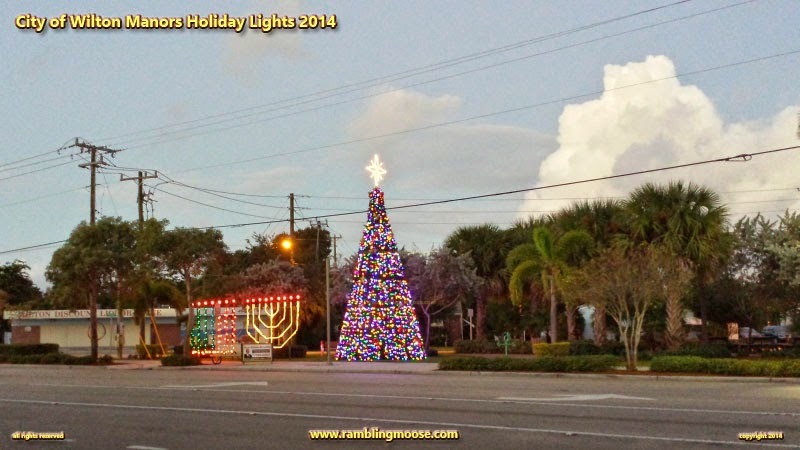 The night before, December 4th, was Wilton Manors' Holiday Lighting party. I should have went, really I should have. I was out walking my trusty sidekick, Rack, the McNab Superdog, and was asked. Not once, but by everyone who stopped to chat with us. That Dog Walk Hour, you're going to run into your neighbors. It's going to happen, just expect it. The nice thing is that most of my neighbors are rather pleasant to talk to. At least those who I see on a regular basis, which is to say those who have dogs. Show me someone who doesn't like dogs, and I'll show you someone who has an axe to grind on some level or another. On the other hand, there are many people who shouldn't own a picture of a stuffed animal let alone an intelligent being. The reasons are many: Not enough time, disposable mindset, not financially ready, don't understand how to properly handle the animal, bought one for "fashion". I could go on. Those are the dogs that are straining at the end of a leash having a fit because you or your own dog are on its planet. But for the most part, you'll meet your neighbors and their dogs around that time of day. I got back to wait to see if I had company to go over there to see the ceremony. That didn't happen and I wasn't going to go on my own. That question I'd have to answer of "Where's Kevin" eleventy-seven times gets truly wearing. The ceremony is an all ages party with soft drinks and cake, usually. It's fun and you get to see all your friends. That "Mayberry" feel of being in a small town that I get is rather strong at this sort of event. When I hear people grouse about where they live, I tell them these stories and suggest they move on in since they'll like it here. But I had missed the ceremony. Too bad, I would have liked to speak with my friends who work for the city and volunteer for it. That lists about 3/4ths of the people I know by name and face here actually. Again, good people, open, easy to talk to. Yes, I'm talking about the people who work for the City Of Wilton Manors. If your experiences differ, you live in the wrong city, come on in, we'll make room for you. Aunt Bea may even have some Apple Pie made up fresh, and if there isn't any stop on in and get some ice cream. There are plenty of places for it. I knew I'd be able to see the tree and the Menorah and Kinara the next morning just before dawn. It was 6:35AM, December 5, 2014 when I took that shot. There's a parking meter I used to frame the shot. I actually had someone stop traffic for me so I could get it. Friendly people here but that was a bit of an overkill. See, they'll do that sort of thing for you, stop traffic so a photographer will get Just That Shot. Thanks, I'm honored and a bit surprised. When they left, I got this one as the sun was starting to come up. So if you want to see our little display, it's at Jaycee Park on Wilton Drive. Park at Hagen Park, and you can see it as clear as day. If anyone asks, tell them Ramblingmoose.com sent you. That's me, the tall guy holding the camera.